Glaucoma is the world's leading cause of irreversible blindness. Glaucoma can develop in anyone but people over age 60, those with a family history of glaucoma, and African-Americans are usually at higher risk. Certain types of medical conditions, such as diabetes or extreme near-sightedness, increase the risk for glaucoma. Glaucoma is a term used to describe several types of eye conditions that affect the optic nerve. In many cases, damage to the optic nerve is related to increased pressure in the eye, also known as intraocular pressure (IOP). Primary open-angle glaucoma is the most common type of glaucoma. In primary open-angle glaucoma, poorly functioning drainage channels prevent fluid from being released from the eye at a normal rate. This in turn causes a rise in intraocular pressure. People with primary open-angle glaucoma usually experience few or no symptoms until the later stages of the disease, when vision loss becomes apparent. There is no cure for glaucoma, but treatment can help reduce intraocular pressure and prevent optic nerve damage and blindness. Glaucoma is usually treated with medications, although laser treatment or surgery may also be recommended for some patients. Most glaucoma medications are given in the form of eye drops. Make sure your doctor or ophthalmologist explains to you the correct way to administer these drops. Glaucoma is a term used to describe several types of eye conditions that result in optic nerve damage. In many cases, damage to the optic nerve is due to increased pressure in the eye, a condition known as high intraocular pressure (IOP) or ocular hypertension. High IOP occurs when the aqueous humor, the clear fluid that fills the front (anterior) chamber of the eye, is unable to flow out of the eye normally. Aqueous humor is produced by the ciliary body in an area behind the colored part of the eye (iris). Its purpose is to nourish certain structures in the front (anterior) part of the eye, including the lens and parts of the iris and cornea, and to keep the eye pressurized so that it does not collapse. The same amount of aqueous humor that is produced within the eye drains out from the eye. When less aqueous humor exits the eye than is produced, the IOP becomes elevated. The normal path of aqueous humor is from the ciliary body, in front of the lens, through the pupil, into the anterior chamber, and finally out the drainage angle where it passes through a sponge-like network of cells called the trabecular meshwork and exits the eye, eventually flowing into the bloodstream. Over time, high IOP can cause damage to the optic nerve, resulting in areas of visual loss in the field of vision (visual field defects). 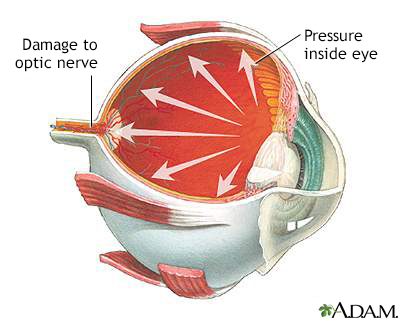 Rarely, glaucoma can develop in people who have normal eye pressure. In these cases, poor blood flow to the optic nerve may be a possible factor in causing optic nerve damage. Glaucoma is a term used to describe several types of eye conditions that affect the optic nerve. In most cases, damage to the optic nerve is related to increased pressure in the eye, also known as intraocular pressure (IOP). Glaucoma can cause partial vision loss, with blindness as a possible eventual outcome. There are several types of glaucoma. Open-angle glaucoma (also called primary or chronic open-angle glaucoma) is the most common form glaucoma. Open-angle glaucoma is essentially a plumbing problem. The drainage angle remains open, but tiny drainage channels in the trabecular meshwork pathway become clogged, causing the aqueous humor to flow out of the eye too slowly. The fluid continues to be produced but does not drain out efficiently. The result is increased intraocular pressure. Open-angle glaucoma usually starts in one eye and often eventually involves both eyes. Eye pressure (intraocular pressure), also referred to as eye tension, is considered high when it is over 21 mm Hg (millimeters of mercury). Most people with glaucoma have a high IOP at the time of diagnosis. However, some people develop optic nerve damage and vision loss even when their IOP is in a normal range (10 to 21 mm Hg). Until recently, this was called normal-tension, or low-tension, glaucoma. Now, it is not considered a separate type of glaucoma but a form of primary open angle glaucoma, in which poor blood flow causes damage rather than increased pressure. Narrow-angle glaucoma (also called angle-closure or closed-angle glaucoma) is less common than open-angle glaucoma in the U.S., but it constitutes about half of the world's glaucoma cases because of its higher prevalence among Asians. Closed-angle glaucoma occurs when the iris is pushed against the lens closing off and blocking the drainage angle. The aqueous humor cannot drain out and eye pressure increases. The rise in pressure may occur very suddenly (a condition called acute angle closure glaucoma). Less commonly, eye pressure can gradually increase over time (chronic angle closure glaucoma). Congenital glaucoma, in which the eye's drainage canal fails to develop correctly, is present from birth. It is very rare, occurring in about 1 in 10,000 newborns. This is often an inherited condition and can usually be corrected with microsurgery. Secondary glaucoma is glaucoma caused by another disease or condition. Both open-angle glaucoma and narrow-angle glaucoma can be secondary conditions. Pseudoexfoliation (PEX) glaucoma occurs when the eye produces an abnormal dandruff-like material that settles on the surface of the lens and iris; it can clog the drainage angle of the eye, leading to a build-up of intraocular pressure. When the iris rubs up against the lens as happens with normal changes in pupil size, this material will be peeled off of the lens making it look like the top layer of the lens itself is peeling away (hence the name pseudo (false) exfoliation). PEX has a strong genetic component but other factors (possibly sunlight, an autoimmune response, or a slow virus) may be needed to trigger the disease. Pigmentary glaucoma starts with a condition called pigment dispersion syndrome, an inherited condition in which granules of pigment (the substance that colors the iris) flake off into the intraocular fluid. These fragments clog the trabecular meshwork and can increase intraocular pressure. Doctors do not know exactly what causes the inefficient drainage process associated with primary open-angle glaucoma. The resulting increased IOP, even if modest, over time can cause increased intraocular pressure and, eventually, damage to the optic nerve. But other factors, such as optic nerve blood supply and nutrition, may also produce optic nerve damage. People with narrow-angle glaucoma often have a structural defect that produces a narrow angle between the iris and cornea where the aqueous humor circulates. This structural defect makes them more susceptible to developing closed-angle glaucoma. In acute closed-angle glaucoma, conditions that dilate (widen) the pupils may cause this shallow angle to suddenly close. Such conditions may include certain drugs (antihistamines, tricyclic antidepressants, some asthma and anti-seizure medications), darkness or dim light, and emotional stress. When glaucoma is caused by other diseases or conditions, it is known as secondary glaucoma. Corticosteroids, commonly called steroids, are a type of drug that has multiple effects on the trabecular meshwork. Steroids come in eye drop, injectable, pill, and inhaled forms. The risks for glaucoma are greatest with locally injected corticosteroids and the unmonitored use of corticosteroid eye drops. However, all types of corticosteroids can increase glaucoma risk when they are taken in high doses or for prolonged periods of time. Certain types of anti-seizure medications, anti-depressants, and sulfa drugs can cause temporary or permanent secondary glaucoma. Glaucoma affects more than 70 million people worldwide and is the leading cause of irreversible blindness. About 3 million Americans have open-angle glaucoma, the most common type of glaucoma (accounting for about 90% of all glaucoma cases). Half of these people are unaware they have glaucoma because the condition causes no pain or visual changes in its early stages. Elevated intraocular pressure is associated with increased risk of optic nerve damage and glaucoma. The risk of developing glaucoma increases with age. Everyone over age 60 is at risk of developing glaucoma. People in certain racial or ethnic groups are at higher risk of developing glaucoma at younger ages. Compared to Caucasians, African-Americans are more than 6 times more likely to develop glaucoma, and 4 times more likely to become blind because of it. African-Americans are also much more likely to develop glaucoma at younger ages. For African-Americans, the risk of developing glaucoma begins at age 40. Hispanic Americans are also at increased risk, especially after age 60. People of Asian descent have a significantly greater risk than other racial groups of developing narrow-angle glaucoma. Glaucoma with normal eye pressure (often called "normal-tension glaucoma") is very common in people of Japanese ancestry. Glaucoma tends to run in families. This is especially true for primary open-angle glaucoma. People with family histories of glaucoma are also more likely to already have some vision loss when they are first diagnosed with glaucoma. Diabetes (type 1 and type 2) and hypothyroidism (underactive thyroid) are the main medical conditions associated with increased glaucoma risk. High blood pressure and migraine headaches are also risk factors. Certain eye conditions, including high nearsightedness (myopia), and previous eye surgery raise the risk for glaucoma. Open-angle glaucoma is a chronic condition that develops slowly over many years. In its earliest stages, it produces no pain, visual changes, or other symptoms. Peripheral vision (vision to the side) gradually decreases. In advanced glaucoma, patients develop "tunnel vision," the ability to see only straight ahead. At end stage, straight-ahead vision decreases. If left untreated, blindness results. Narrow-angle glaucoma develops because of a structural defect in the front part of the eye. If nothing happens to cause a full angle-closure attack, there are no symptoms. In acute angle-closure glaucoma, the pressure inside the eye increases quickly (over the course of hours), and the symptoms are dramatic (an attack). Intense pain in the eyebrow area and blurred vision develop usually in one eye, and the patient often feels like the eye will burst (although it will not). The eye often reddens. The pupil usually doesn't respond to light normally. A person may see rainbow-like halos around lights. Sometimes nausea and vomiting occur. These symptoms may occur on and off and not appear as a full attack. In either case, they indicate a medical emergency. In chronic closed-angle glaucoma, the process is gradual and painless, as in chronic open-angle glaucoma. Although congenital glaucoma is usually present at birth, symptoms generally do not develop in the infant for a few months. Infant corneas are soft so the increased IOP causes the corneas to enlarge. If parents notice that an infant's eyes are enlarging, becoming cloudy, often watering, or tending to close in the presence of light, they should have an ophthalmologist examine the child's eyes. Port-wine stains on a baby's face could indicate Sturge-Weber syndrome, a disorder that sometimes causes glaucoma. Early diagnosis is the key to successful treatment of glaucoma and prevention of blindness. Because chronic glaucoma has no warning symptoms, about half of all people with glaucoma are unaware they have the condition. Although pressure measurements are a necessary part of the complete eye exam, they are no longer considered sufficient to diagnose glaucoma. This is because some people with glaucoma have low pressures and many with high pressure don't have glaucoma. An eye doctor should always inspect the optic nerve through an ophthalmoscope. If the nerve is unusually indented, pale or asymmetric, glaucoma should be suspected even if the IOP is normal. A diagnosis of glaucoma requires both an abnormal appearance of the optic nerve and a visual field defect in at least one eye. In other words, a diagnosis of glaucoma does not depend solely on the presence of increased pressure within the eye. Optic nerve damage or a strong indication of damage must be present. 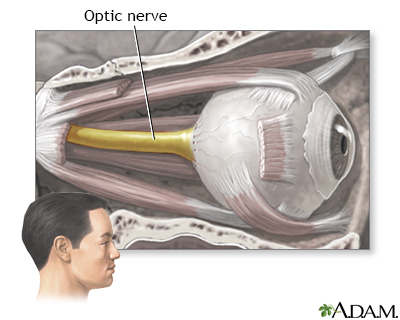 The optic nerve carries the information of vision from the eye to the brain. There has been debate about the relative benefits and risks of routine glaucoma screening in adults. Glaucoma screening can help identify signs of increased intraocular pressure (IOP) and the early stages of primary open-angle glaucoma (POAG). However, treatment of IOP and early POAG can potentially result in harmful effects, such as eye irritation. Some of the older drugs used to treat glaucoma can increase the risk for cataracts. (Those drugs are rarely used these days.) Because of the uncertainty of risks and benefits, the United States Preventive Services Task Force has not yet found sufficient evidence to recommend for or against routine screening for glaucoma in adults. Everyone over age 65 and African-Americans over 40 years old should have periodic eye exams, including tests for glaucoma, every other year. African-Americans ages 20 to 39 should have eye examinations every 3 to 5 years. Other people at higher risk (people with diabetes, history of eye injuries, a family history of glaucoma, or those taking corticosteroid medications) should have eye examinations every year after age 35. People with known glaucoma should have frequent examinations of the optic nerve and the field of vision and be sure treatment is maintaining a safe eye pressure. After these exams, the ophthalmologist will assess current treatment and make necessary adjustments. method uses a blue-light filter and a tonometer, a small, smooth cone-like device, attached to a slit-lamp, which is moved forward toward the patient's face. uses an electronic pen with a digital read-out. approach does not use a tonometer. It applies a puff of air to measure the force needed to indent the eye. method, the patient reclines and the doctor rests the tonometer very lightly against the eye. IOP is measured by the weight needed to indent the cornea. This method is not considered as accurate as the others. In general, normal IOP is usually maintained at measurements of 10 to 21 mm Hg. Intraocular pressure over 21 mm Hg indicates a potential problem. The test is not completely reliable, however. Only about 10% of people with IOP levels of 21 to 30 mm Hg will actually develop glaucoma and optic nerve damage. On the other hand, many people with glaucoma have normal pressure, at least for part of the time. Also, the IOP can vary depending on the time of day, so one measurement is never conclusive. Corneal thickness is an important factor in measuring IOP because thicker corneas cause higher readings on most tonometers. In other words, there can be two eyes with the same IOP, and the eye with the thicker cornea will show a higher reading on tonometry. This is important because the conventional guidelines of the normal IOP range may not apply in eyes with thin corneas; the IOP can be elevated even if the tonometry is normal. A conversion factor exists to adjust the tonometry measurement so that the true IOP can be known. Measurement of cornea thickness is typically done by ultrasound. To check for damage in the optic nerve, the doctor first uses eye drops to dilate (widen) the pupils and then examines the eyes with a magnifying lens instrument such as an ophthalmoscope, which has a light on one end. A pale optic disc color. Using a special camera, photos of the optic nerve can be taken that, when viewed with a special viewer, will show the optic nerve in three dimensions. This makes it easier to evaluate the optic nerve cup and creates a record for future comparison. This is an imaging device that uses special light to produce a cross-sectional image or measurements of the back of the eye. In glaucoma, it is most valuable for measuring the thickness of the retinal nerve fiber layer (RNFL). The RNFL is the extension of the bundled nerve fibers that make up the optic nerve. OCT can be performed periodically to look for progressive thinning of the RNFL. 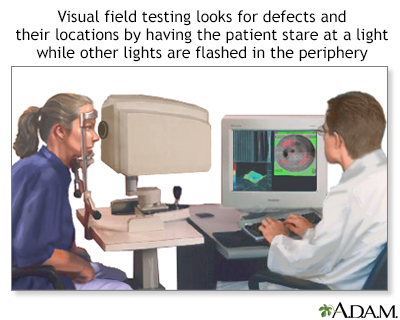 This often occurs before there is optic nerve cupping or visual field defects. Using an instrument called a gonioscope, ophthalmologists can inspect the front of the eyes and assess the drainage angle between the cornea and the iris and the channels in the trabecular meshwork. This test can help differentiate between closed- and open-angle glaucoma. Glaucoma cannot be cured, but treatment may help delay disease progression. Most treatments for glaucoma aim to reduce IOP and its fluctuations, thus preventing optic nerve damage and blindness. Medications in the form of eye drops are the most common treatment for glaucoma. Laser treatments or surgery may be recommended for more severe or emergency cases. Many people have high IOP but no sign of nerve damage. Over the course of 20 years, only 10% to 30% of these people will actually develop glaucoma. Nevertheless, once glaucoma has destroyed optic nerve fibers, no treatment can reverse the damage. However, not all people with high eye pressure develop optic nerve damage and serious vision problems. Nor does treatment prevent progression in some patients. Medications used for glaucoma also can carry side effects and risks. The decision to start treatment usually depends on the IOP, the appearance of the optic nerve (there can be changes before there are visual field defects) and risk factors including age, ethnicity, family history and other medical conditions. There are many different drugs for treating glaucoma. The drugs reduce pressure in the eye but all have a number of side effects that affect other parts of the body. Occasionally, some side effects can be severe. Many of the drugs used for glaucoma can interact with common medications for other conditions. And, many patients require two or more drugs. If your doctor prescribes more than one medication, be sure you understand when you should take each drug and how long you should wait between applying each drop. Ask your doctor to write down a schedule for you. Let your doctor know if you experience any side effects. To prevent optic nerve damage, it is very important to take your medication on a regular basis and not skip doses. Prostaglandin-like drugs are generally the first-line treatment for glaucoma. They include latanoprost (Xalatan), bimatoprost (Lumigan), travoprost (Travatan), and tafluprost (Zioptan). Beta-blockers such as timolol (Timoptic, generic) and other brands are a second choice. Carbonic anhydrase inhibitors (CAIs), such as dorzolamide (Trusopt, generic) and brinzolamide (Azopt). Alpha agonists, such as apraclonidine (Iopidine, generic) and brimonidine (Alphagan, generic). Miotics are rarely used to treat primary open-angle glaucoma (POAG). Some drugs are available as combination eye drops. For example, Cosopt combines the beta blocker timolol and the CAI dorzolamide. Combigan combines timolol and the alpha agonist brimonidine. Considerations for a pregnant woman with glaucoma can be complicated. All of the drugs used for glaucoma are absorbed by the body, cross the placenta, and are excreted in breast milk. Many have effects that may interfere with or adversely affect pregnancy. Women should discuss with their doctors going off medication, particularly during the first trimester. They should be monitored during that time for increasing eye pressure. IOP tends to drop during pregnancy, although usually not by a significant degree. In addition, changes in IOP and visual loss vary greatly. Some women have no IOP change or visual loss during pregnancy, while others may experience an increase in IOP or worsening of visual loss. Your ophthalmologist must carefully consider your individual case and talk with you about the risks and benefits of continuing glaucoma medication during pregnancy. If women need to take medications, they should try to take the lowest effective dose possible. Filtration surgery (trabeculectomy). This uses standard surgical instruments to open a passage in the eye for draining fluid. Laser trabeculoplasty. This procedure uses a laser to burn tiny holes in the drainage area. In general, surgery is used for patients who have not been helped by medications. However, in some cases doctors may recommend surgery before or in place of drug treatment. Surgery does not cure glaucoma, and over half of patients will need medication or a repeat surgical procedure within 2 to 5 years. When following patients who are suspicious for glaucoma and patients who have already been diagnosed, monitoring for progression is of high importance. Regular testing of the visual field and optic nerve imaging are necessary to determine if the current treatment is adequate. In fact, the question the doctor asks themselves at each interval visit for patients with glaucoma is whether current treatment is adequate. The answer lies with examining the optic nerve and the visual field. IOP measurement is important to determine if a certain treatment is having an effect, but whether or not that effect is enough has to be based on whether there is progression of the visual field abnormalities or progression of optic nerve changes. Nearly all glaucoma medications are prescribed to reduce eye pressure. They generally work by reducing the production of aqueous humor and increasing fluid outflow (drainage). In most cases, these drugs are taken as eye drops. If drops alone do not work, your doctor may also prescribe an oral medication (pill). Prostaglandin analogs are hormone-like substances that help widen blood vessels. Drugs that mimic natural prostaglandins increase the drainage of aqueous humor to help reduce intraocular pressure. Prostaglandin-like drugs are the first-line treatment for glaucoma. Latanoprost (Xalatan) was the first prostaglandin analog to be approved as first-line treatment for elevated eye pressure. Four newer prostaglandin analogs are travoprost (Travatan), bimatoprost (Lumigan), tafluprost (Zioptan), and latanoprostene (Vyzulta). These drugs are used to reduce eye pressure in patients with open-angle glaucoma and ocular hypertension. Side effects include itching, burning, and eye redness. All of these drugs may permanently change eye color from blue or green to brown. Topical beta-blockers lower the pressure inside the eye by inhibiting the production of aqueous humor. Timolol (Timoptic, Betimol) is the original beta-blocker. Other examples used for glaucoma treatment are levobunolol (Betagan), carteolol (Ocupress), metipranolol (OptiPranolol), and betaxolol (Betoptic). After a beta-blocker is administered, only a tiny amount of the drug is absorbed by the cornea. Most of it enters in the bloodstream. These drugs, therefore, can cause side effects in parts of the body other than the eyes ("systemic" side effects). Cause reduced sexual drive, fatigue, depression, anxiety, and breathing difficulties. Lower heart rate and reduce blood pressure. Worsen severe asthma or other lung diseases. Cause a sudden rise in eye pressure, particularly if a patient has switched to a beta-blocker from another type of glaucoma medication. It is important that IOP be checked shortly after the other drug has been withdrawn. When beta-blockers are used to treat one eye, the other (contralateral) eye also experiences a lesser, but still significant reduction in IOP. Topical beta-blockers can interact with oral medications, such as other beta-blockers, calcium-channel blockers, or the antiarrhythmic drug quinidine. People with diabetes who take insulin or hypoglycemic medications should be aware that beta-blocker side effects may mask the symptoms of hypoglycemia (low blood sugar). Carbonic anhydrase inhibitors (CAIs) are used for glaucoma when other drugs do not work. They may be combined with other medications. In addition to reducing aqueous humor production, CAIs may improve blood flow in the retina and optic nerve (beta-blockers do not). Improving blood flow may make the optic nerve more resistant to damage from high IOP. Eye drop CAIs include dorzolamide (Trusopt) and brinzolamide (Azopt). Side effects may include stinging in the eye, watery or dry eyes, or bitter taste. Brinzolamide is a newer medication that may cause less stinging than dorzolamide. Oral (pill) forms include acetazolamide (Diamox) and methazolamide (Neptazane). Although pill forms are more effective than eye drops, they have significantly more side effects and are rarely used for long-term treatment. Unpleasant side effects include frequent urination, stomach problems, and tingling in fingers and toes. People who are allergic to sulfa drugs or who have a history of kidney stones should not use these drugs. CAIs can also produce a toxic reaction when taken with large doses of aspirin. Alpha agonists, also called adrenergic agonists, reduce the production of aqueous humor and increase drainage. They include apraclonidine (Iopidine), brimonidine (Alphagan), and dipivefrin (Propine). The most common side effects are dry mouth, nose, and eyes, and blurred vision. Alpha agonists may also trigger an allergic reaction that causes red and itching eyes and lids. Miotics, also called cholinergic agonists, tighten the iris muscles and constrict the pupil. This action pulls the iris away from the trabecular meshwork and allows the aqueous humor to flow out through the drainage channels, reducing the pressure inside the front of the eye. Pilocarpine (Isoptocarpine, Pilocar) was the most widely used anti-glaucoma drug before timolol was introduced. It is the preferred miotic. However, it has to be taken several times a day and many people have difficulty complying with this regimen. Carbachol (Isopto) is another miotic. Miotics constrict the pupil and so decrease the amount of light that can enter the eye. This can cause dim vision and night blindness. People who take miotics often complain of difficulty seeing in darkened rooms or driving at night. People who have cataracts in addition to glaucoma may have particular problems with worsened vision. People who have taken miotics for years may find that their pupils won't expand (dilate) which can make cataract surgery more challenging. People with high amounts of nearsightedness are at more risk for retinal tears and detachments if they take miotics. In narrow-angle glaucoma, miotics can be used to prevent an attack of angle closure glaucoma; this is often done while waiting to perform a more definitive treatment. Many people skip doses of their glaucoma medications, sometimes because of side effects and sometimes because of confusing or time-consuming regimens. Skipping even a few doses can greatly increase the risk of visual loss. It is essential that you inform your doctor if you are not regularly taking your medication. Otherwise, your doctor may increase the dosage, thereby causing unwelcome side effects. People who do not regularly take their glaucoma medication are at high risk for blindness. If you have problems taking your medications or sticking to the dosing regimen, talk with your doctor. Pharmaceutical manufacturers use colored tops, yellow for timolol, for example, and green for pilocarpine, to help prevent mix-ups. Creating a chart scheduling each drug by color can be helpful. Small electronic timers are available that signal times for taking the medications. The timing of these combinations is important. Some people will use the alarm function of a smartphone. Some people may be candidates for single medications that combine two drugs, such as Cosopt, which contains both dorzolamide and timolol. This medication requires only one drop twice per day. People who need additional glaucoma drugs, however, will need to take these two drugs separately. When using any drug for a long period of time, side effects are a potential problem. If they become severe, ask your doctor about reducing the dosage or trying other drugs. If you use both ointments and eye drops, take the eye drops first. Wash your hands before applying eye drops. Tilt your head back and, with one hand, pull the lower eyelid down to form a pocket. With your other hand, hold the bottle as close as possible to your eye. Don't let the bottle directly touch your eye or eyelid. After you have placed the drop, close your eye or press your index finger against the corner of the eye near your nose. Gently move the lower lid upward until the eye is closed. Keep your eye closed for at least 1 minute. This prevents the drop from draining out. Wait at least 5 minutes before applying another drop or a different medication. Acute angle closure glaucoma is an emergency situation. Doctors may administer a combination of two or more medications to reduce eye pressure quickly before it can damage the optic nerve and cause visual loss. Apraclonidine (Iopidine) is a powerful drug used before and after laser surgery to prevent an increase in fluid pressure and is more effective than other medications. In addition to standard drugs, doctors may also administer glycerin by mouth or mannitol or acetazolamide intravenously. Surgery is almost always performed once the pressure is reduced. Laser surgery (trabeculoplasty). This procedure partially opens the drainage area. It does not reduce pressure as much as filtering surgery (trabeculectomy) but it has fewer adverse effects. Filtration surgery (trabeculectomy). This conventional surgery procedure opens the full thickness of the drainage area. Newer non-penetrating surgical techniquesinclude canaloplasty but it is not yet clear how they compare to trabeculectomy in terms of safety and long-term reduction of IOP. The procedure uses a laser to cause 80 to 100 tiny burns or tissue shrinkage areas in the trabecular meshwork. The two main types of surgery are argon laser trabeculoplasty (ALT) and selective laser trabeculoplasty (SLT). SLT is performed more often than ALT. A tiny scar forms, which increases fluid outflow. The procedure is performed on an outpatient basis, takes 15 minutes, causes almost no discomfort, and has very few complications. Laser surgery is not a cure. Although it reduces intraocular pressure, patients still need to take medications every day. Within 2 to 5 years eye pressure increases and most patients require either additional surgery or new medications. Filtration surgery has been used for more than 100 years with only minor modifications. It uses conventional surgical techniques known as full-thickness filtering surgery or guarded filtering surgery (trabeculectomy). (the white part of the eye) for draining excess eye fluid. A flap is created that allows fluid to escape without deflating the eyeball.
) so that iris tissue won't come forward and block the flow of fluid through the sclerostomy. nearly always forms over the opening, which is a sign that fluid is draining out; the blood vessels in the bleb absorb the eye fluid so that the bleb does not continue to expand. Although surgeons aim for a thick bleb, which poses less risk than a thin one for later leakage, the ideal operation would have no bleb at all. The procedure is usually performed on an outpatient basis but some patients may need to stay overnight in the hospital. For many people, trabeculectomy eliminates the need for medications. In some people, eye pressure eventually increases again and people may need to go back on medication or undergo a second trabeculectomy. A newer instrument called a trabectome allows for a less invasive type of trabeculectomy surgery. The trabectome procedure uses an electrosurgical pulse to remove a small section of the trabecular meshwork. Eye doctors are developing other surgical approaches as alternatives to trabeculectomy. They include canaloplasty, a minimally invasive procedure that uses a small microcatheter tube to hold open the Schlemm's canal. Many of the serious side effects or complications that occur with filtration surgery involve blebs (blister-like bumps). Blebs, particularly thin ones, commonly leak. Leakage can occur early on or sometimes as late as months or years after surgery. Untreated, leaks can be serious and even cause blindness, usually because a leaking bleb is an easy avenue for an infection to enter the eye. Surgical repair is the most effective way of managing leaking blebs, although drug therapies, pressure patching, and other nonsurgical techniques may be tried first. Due to the dangers of leaking blebs, doctors recommend lifelong monitoring after surgery. In some cases, scars form around the incision, closing up the drainage channels. Scarring can also occur in the bleb itself, which destroys the bleb blood vessels that ultimately absorb the eye fluid and carry it away. Scarring is a particular problem in young patients, African-Americans, and patients who have taken multiple drugs, have had an inflammatory disease, or have had cataract surgery. Releasing the surgical stitches used in the procedure may help prevent scarring and pressure build-up. A second procedure called bleb needling can sometimes open up the scarred area and restore drainage. With this technique, the tip of a very fine hypodermic needle is used to carefully cut loose the particles closing off the drainage area. Drugs may be used to prevent scarring. The trabeculectomy procedure significantly increases the risk for the later development of cataracts. Click to view images of a cataract surgery. Drainage implants, also known as tube shunts or aqueous shunts, may be used to drain fluid if patients have not been helped by laser or filtration surgery. They are also used to treat children with glaucoma. An implant, most commonly a small silicone tube, is inserted into the eye's front (anterior) chamber. The tube drains the fluid onto a tiny plate that is sewn to the side of the eye. Fluid collects on the plate and then is absorbed by the tissues around the eye. The patient wears an eye patch and shield until the first post-operative visit. Healing time takes about 6 to 8 weeks. Complications are uncommon but may include very low eye pressure (hypotony), drooping eyelid, double vision, and retinal detachment. Occasionally the tube falls out or migrates to a wrong position and needs to be replaced. Ideally, someone who has narrow angles and is at risk for an acute attack of narrow-angle glaucoma will have treatment for the condition before actually having an attack. If an attack does occur, it is an emergency situation that requires immediate medical attention. Doctors will first try to quickly reduce eye pressure using medications ("break" the attack), and then perform surgery. Laser iridotomy is the standard procedure. It uses a laser to make a small hole in the iris to prevent aqueous humor from building up behind the iris and pushing the iris forward, thereby closing off the angle. In some cases, conventional surgery, called peripheral iridectomy, may be performed. It involves surgically removing a small piece of the iris. Laser iridotomy almost never requires hospitalization, and postsurgical treatment includes only aspirin and eye drops. It has almost completely replaced conventional surgery, which requires anesthesia and hospitalization. Vision will be blurred, and recovery can take 4 to 8 weeks. Following surgery, patients can usually safely use previously restricted medications, such as anticholinergics, antihistamines, and certain antidepressants. In many cases, doctors recommend performing an iridotomy on the other eye at a later date. For people who have mild glaucoma, the doctor may recommend performing only cataract surgery and controlling the glaucoma with medication. For people who have moderate-to-severe glaucoma, the traditional approach has been combination cataract-glaucoma surgery (phacotrabeculectomy). This combination surgery involves performing both trabeculectomy (glaucoma filtration surgery) and phacomulsification (cataract extraction). Recently a new class of surgical procedures for glaucoma has been developed called minimally invasive glaucoma surgery (MIGS). Most of these procedures involve implanting a small drainage device in the eye that utilizes one of several methods to bypass the trabecular meshwork. MIGS has a much lower complication rate than trabeculectomy and is often combined with cataract surgery for patients with both cataracts and glaucoma. The latest class of MIGS is an implantable device that is actually a long term drug delivery system for glaucoma medication. Some evidence suggests that regular exercise may modestly reduce eye pressure in patients with open-angle glaucoma. Exercise has no effect on closed-angle glaucoma. Exercise can be dangerous for people who have pigmentary glaucoma. Vigorous high-impact exercise causes pigment to be released from the iris, which increases eye pressure. Glaucoma patients should avoid yoga and other exercises that involve head-down or inverted positions. Talk with your doctor about an appropriate exercise program. Diet most likely plays very little role in glaucoma. There has been no definitive evidence for an association between important nutrients associated with protection against other eye disorders, including vitamins C, E, A, and carotenoids. Some studies have shown that large amounts of caffeine consumed in a short period of time can elevate eye pressure for up to 3 hours. Drinking large amounts (a quart or more) of any liquid within a short time, about 30 minutes, appears to increase pressure. People with glaucoma should have plenty of fluids, but they should drink them in small amounts throughout the day. Glaucoma may cause the eyes to be very sensitive to light and glare and glaucoma medications can worsen this problem. Sunglasses help provide relief and can also block the harmful ultraviolet (UV) radiation that is damaging to eyes. Look for sunglasses whose product labels state they block 99% to 100% of UV light (which is equivalent to UV absorption up to 400 nm). Polarized and mirror-coated lenses do not offer any protection against UV radiation. Colored tints, such as blue light-blocking lenses (which are usually amber in color), do not provide UV protection. A number of herbal and nontraditional remedies have been advertised as glaucoma remedies. A few studies have reported that the herbal remedy ginkgo biloba may have properties that offer benefits to patients with glaucoma, including increasing blood flow in the eye without altering overall blood pressure, heart rate, or intraocular pressure. More research is needed. There is no evidence that bilberry, another popular herbal remedy for eye disorders, is effective in preventing or treating glaucoma. Marijuana can lower ocular pressure, but only for a few hours, and it is no more effective than prescription medications. Due to its lack of long-term effectiveness, and mood-altering side effects, marijuana is not recommended for glaucoma treatment. Boland MV, Ervin AM, Friedman DS, et al. Comparative effectiveness of treatments for open-angle glaucoma: a systematic review for the U.S. Preventive Services Task Force. Ann Intern Med. 2013;158(4):271-279. PMID: 23420235 www.ncbi.nlm.nih.gov/pubmed/23420235. Damji KF, Sandhu S. Laser trabeculoplasty and laser peripheral iridectomy. In: Yanoff M, Duker JS, eds. Ophthalmology. 5th ed. Philadelphia, PA: Elsevier; 2019:chap 10.25. Garcia-Medina JJ, Garcia-Medina M, Garrido-Fernandez P, et al. A two-year follow-up of oral antioxidant supplementation in primary open-angle glaucoma: an open-label, randomized, controlled trial. Acta Ophthalmol. 2015;93(6):546-554. PMID: 25545196 www.ncbi.nlm.nih.gov/pubmed/25545196. Goldberg JL, Wax M, Clark A, Civan MM. Mechanisms of glaucoma. In: Yanoff M, Duker JS, eds. Ophthalmology. 5th ed. Philadelphia, PA: Elsevier; 2019:chap 10.3. Gross RL, McMillan BD. Current medical management of glaucoma. In: Yanoff M, Duker JS, eds. Ophthalmology. 45th ed. Philadelphia, PA: Elsevier; 2019:chap 10.24. Gupta D, Chen PP. Glaucoma. Am Fam Physician. 2016;93(8):668-674. PMID: 27175839 www.ncbi.nlm.nih.gov/pubmed/27175839. Jonas JB, Aung T, Bourne RR, Bron AM, Ritch R, Panda-Jonas S. Glaucoma. Lancet. 2017;390(10108):2183-2193. PMID: 28577860 www.ncbi.nlm.nih.gov/pubmed/28577860. Law SK, Lowe S, Law SM, Giaconi JA, Coleman AL, Caprioli J. Prospective evaluation of acupuncture as treatment for glaucoma. Am J Ophthalmol. 2015;160(2):256-265. PMID: 25935101 www.ncbi.nlm.nih.gov/pubmed/25935101. Lee D, Yung ES, Katz LJ. Clinical examination of glaucoma. In: Yanoff M, Duker JS, eds. Ophthalmology. 5th ed. Philadelphia, PA: Elsevier; 2019:chap 10.4. Lim DKA, Koh VTC, Aquino MCD, Chew PTK. Angle-closure glaucoma. In: Yanoff M, Duker JS, eds. Ophthalmology. 5th ed. Philadelphia, PA: Elsevier; 2019:chap 10.12. Moyer, VA, U.S. Preventive Services Task Force. Screening for glaucoma: U.S. Preventive Services Task Force Recommendation Statement. Ann Intern Med. 2013;159(7):484-489. PMID: 24325017 www.ncbi.nlm.nih.gov/pubmed/24325017. Pillunat LE, Erb C, Jünemann AG, Kimmich F. Micro-invasive glaucoma surgery (MIGS): a review of surgical procedures using stents. Clin Ophthalmol. 2017;11:1583-1600. PMID: 28919702 www.ncbi.nlm.nih.gov/pubmed/28919702. Prum BE Jr, Herndon LW Jr, Moroi SE, et al. Primary angle closure Preferred Practice Pattern(®) Guidelines. Ophthalmology. 2016;123(1):P1-P40. PMID: 26581557 www.ncbi.nlm.nih.gov/pubmed/26581557. Prum BE Jr, Lim MC, Mansberger SL, et al. Primary open-angle glaucoma suspect Preferred Practice Pattern(®) Guidelines. Ophthalmology. 2016;123(1):P112-51. PMID: 26581560 www.ncbi.nlm.nih.gov/pubmed/26581560. Saeedi OJ, Kalarn SP, Ramulu PY, Friedman DS. Epidemiology of glaucoma. In: Yanoff M, Duker JS, eds. Ophthalmology. 5th ed. Philadelphia, PA: Elsevier; 2019:chap 10.1. Stagg BC, Lee PP, Stein JD. Screening for glaucoma. In: Yanoff M, Duker JS, eds. Ophthalmology. 5th ed. Philadelphia, PA: Elsevier; 2019:chap 10.2. Tai TYT, Piltz-Seymour JR. When to treat glaucoma. In: Yanoff M, Duker JS, eds. Ophthalmology. 5th ed. Philadelphia, PA: Elsevier; 2019:chap 10.22. Tan JC, Kaufman PL. Primary open-angle glaucoma. In: Yanoff M, Duker JS, eds. Ophthalmology. 5th ed. Philadelphia, PA: Elsevier; 2019:chap 10.10. US Preventive Services Task Force (USPSTF), Siu AL, Bibbins-Domingo K, et al. Screening for impaired visual acuity in older adults: US Preventive Services Task Force Recommendation Statement. JAMA. 2016;315(9):908-914. PMID: 26934260 www.ncbi.nlm.nih.gov/pubmed/26934260.